This fully-renovated 3-star hotel is located in Geneva city centre, just a few steps from the main train station. Lake Geneva, the old town and many other sights and attractions are within a few minutes' walk of the hotel. All rates at the ibis Styles Genève Gare include an all-you-can-eat buffet breakfast and unlimited Wi-Fi access. Great hotel. From check in to check out everything was as it should be for a short business trip. Great location and friendly staff. A stay without surprises and as expected. Overnight stay prior to returning home having stayed elsewhere in Switzerland, the rooms were comfortable and clean, the shower was lovely and the staff very helpful. The breakfast was lovely, good choice, freshly made and nicely presented. I stayed for a business trip and was very comfortable overall. The breakfast and staff were fantastic. The room was clean and adequate, although it would have been nice for there to be body lotion available. Also, the room temperature got hot and stuffy so I had to request the key to open my window a few times. Will return again! I'm very satisfied with the quality of the service. Breakfast is very good. Room is very clean and comfortable. Staff is friendly and helpful. Location is very convenient. Thank you very much! Overall everything was almost perfect. Our room was clean, and the bed very comfortable. Breakfast was very nice, but most important of all, for us, the coffee was delicious. The only negative aspect was, as we wanted to pay for our stay in cash, the reception was not able to give us change for a CHF 200 note. Otherwise, everything was ok.
this was my second stay at this hotel. I found everything to my satisfaction. clean and efficient. freindly and very helpfull reception staff. Loved our stay at your hotel and Geneva. This hotel is clean, comfortable and within easy walking distance of everything in central Geneva. It is right opposite the station so very easy to find. The free drink on arrival was a welcome surprise. The breakfast selection is good. Overall a very pleasant stay. Excellent location and very clean room. Only negative is that the room was very warm and the air conditioning did not work to cool it down. Check in online was ideal and everything was waiting for me. My request for a quiet end of corridor room away from the lift was met perfectly so excellent first impression. Room was immaculate clean, especially the bathroom, so compliments to the housekeeping team. Breakfast was very good and plenty to choose from. All in all I couldn't fault the stay of 3 nights - even the shoe shine machine was a nice touch! Very clean and comfortable room as it should have been for the rates charged! I suppose its the laws of supply and demand that enable you to charge so extortionately for the Saturday night! A fine way to reward loyalty scheme members. A few minor issues - had to ask for milk on two fo the mornings, no celery one morning, no scrambled egg one morning meaning and the replenishment took about 10 minutes to come. Easy check in. Pleasant staff. Clean. Adequate breakfast options. A safe in the room would have been nice though. The staff from top to bottom have customer service excellence dialed in. From the early check-in,, a couple extra pillows to the healthy variety in the airy breakfast area and the unique self-service beverage service.m the evening , the Center Gare Was beyond expectations for our 12 night stay. We stayed with Ibis hotels before, but this was our first. Styles experience. Besides being one of the cleanest and well maintained chains, the friendly front desk pros (Malika, Leila, Julimide, Sophia) were the hub , very helpful and yes-minded types whom made us feel like home away rom home. The location was surprisingly convenient - we could get anywhere we needed by bus within a block of the hotel, a huge Manor store with rooftop dining right next door, and the train station is duectly across the street with a 12 minute airport express. Despite beings in the thick of foot traffic, the hotel feels quite secure has a carddt access to all exterior doors elevators and rooms. Definitely recommend bilingual a street side room facing the cathedral and a view of the mountains-, and maybe even a diaily wake up bird serenade. We visit family In Geneva but we’ll be back again. Excellent experience. Very modern and clean in an excellent location, opposite the station and surrounded by some nice restaurants (or McDonalds) - whatever your choice. An ideal stopover from our skiing trip. Would bring my family for a long weekend next time. Hotel was centrally located. Very close to Cornavin station and only short walk down to lake. 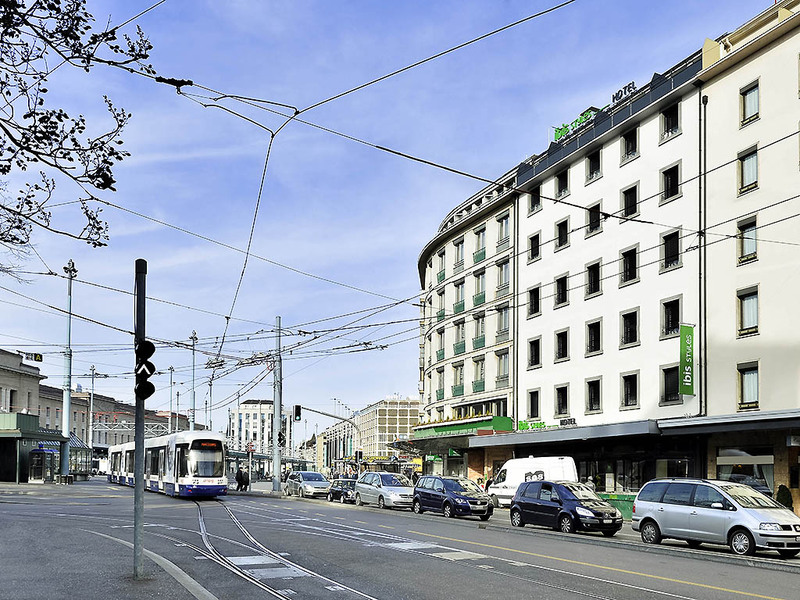 Staying within a minutes walk for Geneva's central railway station, this modern, clean hotel has very helpful and friendly staff who cover all the bases in a quiet and efficient manner. Any requests are dealt with a smile and promptly. The rooms are immaculate and the breakfast has sufficient variety to suits most needs. Lovely stay in a lovely hotel.